Human being can’t trust their hearts. You might get some things right, but you can’t even really know yourself unless you ask God to share His perspective on you. But that verse in Jeremiah is addressed to the person who’s heart departs from the Lord. What about once you are in relationship with God and making Him the one your trust? What does that do to your heart? If you do a word-search for “heart” in the book of Proverbs, you’ll see two different pictures of what our hearts can be like. We can let wisdom enter into our hearts, trust in Yahweh, and keep His commandments (Prov. 2:10; 3:1, 5). Or we can have a heart filled with perverseness, worthlessly wicked, and abominable in God’s eyes (Prov. 6:14; 10:20; 11:20). We make choices that determine the state of our hearts. We can either choose to walk contrary to God and become less and less like Him, or we can walk with God and let Him transform our hearts. That’s your choice. That’s quite a responsibility, but it’s also something of a relief. No one else gets to make the decision about what kind of heart you have. It’s up to you. It’s hard to get to the point where you trust God more than you trust yourself; where you accept His viewpoint as authoritative even when you have a different idea. But that’s a place we have to get to. God cares about what we do as well as the “why” behind our actions. He does take our intentions into consideration, but good intentions don’t excuse bad conduct or erase sins. We can be forgiven when we repent, of course, but God still wants to see growth. He wants us to apply our hearts to wisdom, not stay ignorant. Especially not willfully. We don’t get to decide what’s right and what’s not. Nor are zeal and good feelings enough. Jesus said, “If you love me, keep my commandments” (John 14:15, KJV). If we care about God, then we should show that by submitting to His authority. In the book of Ezekiel, God replies to Israel’s claim that He’s unfair. After explaining how He rewards righteous people for righteous deeds and wicked people for wicked deeds while also allowing for repentance and change, He points out that they’re actually the unfair ones (Ez. 18:1-29). Then He offers them a solution to the present, iniquitous state of their hearts. Other verses show that the sort of new heart which can obey God’s commands is a gift form Him (Eze. 11:19-20; 36:26-27). But He doesn’t force this gift on us. We’re involved in making our hearts new by choosing to accept God’s authority in every area of our lives and to submit to His work in us. We are living in the new covenant days. God is writing His character into our hearts right now if we’re in His church. We’re being changed as we learn how to think, feel, and act the way God does. 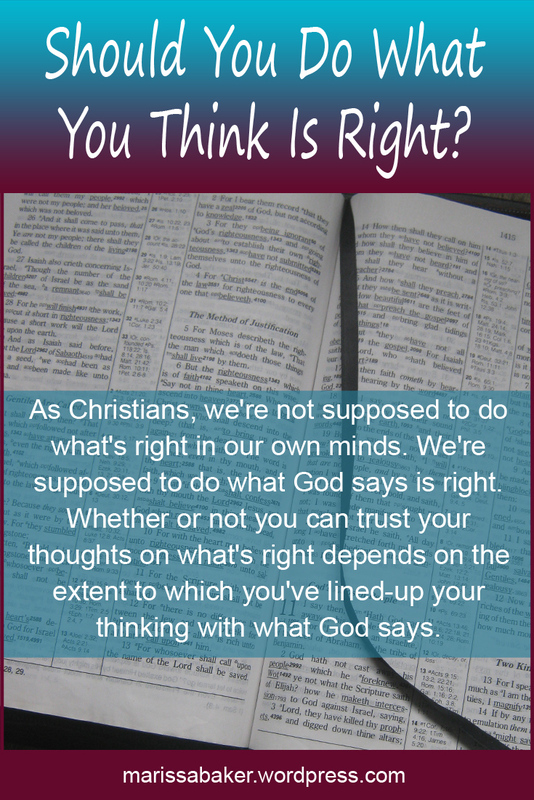 And that means our thoughts on what’s right are (or should be) lining up with God’s thoughts on what’s right. The more like Him we become and the more we put on the mind of Christ (1 Cor. 2:16), the less we’ll have to second guess ourselves. So should you do what you think is right? 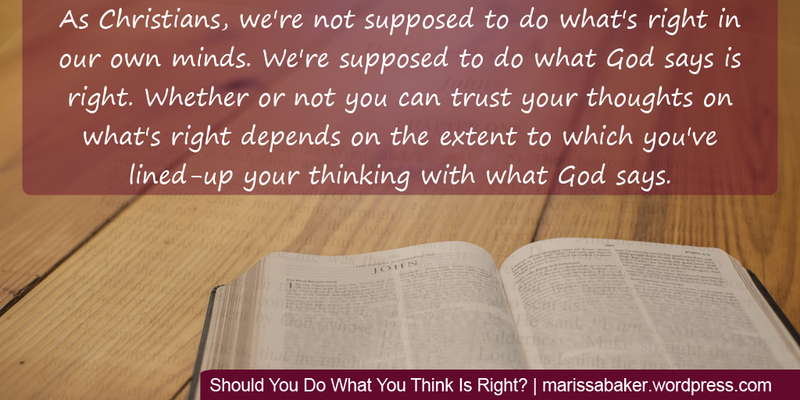 That depends on whether or not you’ve lined-up your thinking with what God says is right. Ah I always wondered what “trust your heart” was supposed to mean. I knew it was some form of secular feel-good nonsense, but what anyone meant by saying it was beyond me. Very nice post.